For those who suffer from chronic pain, self care is critically important. Of course, you need to have it checked out by medical professionals. But it's often tricky to treat effectively, so it's important to have some holistic home-care techniques for it in your back pocket. You'll find four methods for this further on down this page, but first let's look more closely at the phenomenon of long-term pain. Is Pain Just Physical, Or Is There More To It? Relief from chronic pain can be elusive to scientists and sufferers alike. I think it's because they're looking for solutions in the wrong place—in the physical body. As the author/teacher Esther Hicks says: "Your body is a pure reflection of the balance of the thoughts that you think." In my practice, I find this is true. Take the example of someone who is still suffering from an injury that happened years ago. I see this kind of thing all the time. In one year, nearly every molecule of that person's body has been replaced by different molecules. In other words, the matter part of his body is not the same matter. 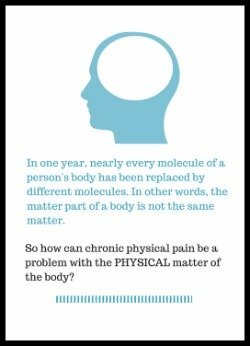 So how can the chronic physical pain be residing in the PHYSICAL matter of his body? It has to be something else that creates and/or holds that discomfort or dysfunction in place. At this point, we can't know for sure exactly what that underlying force is: science can't measure it yet. However, from my experience, I believe that the real source of the suffering is energetic — a disturbance in the energy field held there by thoughts and emotions from that long-ago physical or emotional injury. So to deal with long-term physical suffering, it may not be enough to work on a physical level, although that can be a necessary part of the puzzle. For lasting resolution, you may also have to take a more holistic approach. Here are some ideas that may help provide relief, including exploring your life's alignment with your higher self, using the power of your consciousness (or mindfulness, if you prefer that term), working with energy (acupressure), and mobilizing the astonishing potential of your breath. These are all wonderful holistic medicine tools for family health care. Long-term physical discomfort can be a message, kind of like a recurring dream. Decoding the message can often be helpful, both in defusing the discomfort, and/or in moving forward in some important area in your life. Here are some questions you can ask yourself to prompt new insights about your physical body, your life or both. See which ones resonate with you, then give yourself some quiet time and space. Drop the question(s) into your awareness, like dropping a pebble into a still pond, and see where the ripples lead or what they tell you about the riddle of your physical discomfort. Where am I out of integrity — not keeping promises or commitments to myself or others? Where am I out of harmony with my own essence? Where am I not loving or respecting myself enough? Where am I not protecting myself? Where am I out of connection — with my loved ones, with my spiritual source, with the earth or sky? Where am I letting the energy, needs or concerns of others into my life too much? Where do I need to give myself permission to create stronger boundaries? Where am I not standing up for what I need and want? Where am I out of the present--stuck in the past or projecting into the future? Where do I need stillness? Where do I need movement? Where am I resisting change I need to make or a path I need to walk? Is there something I'm resisting looking at, or an emotion I'm resisting? Are there ways in which I'm not living up to the fullness of who I am? Am I giving too much away? Am I holding back? Where could I be in better alignment with my life purpose? Are there places in my life where I'm judging myself harshly, trying to be too perfect, or not cutting myself enough slack? Am I making room for joy? Am I telling myself stories that are holding me back or holding the pain in place? Are there ways I need to move forward? Or am I pushing too hard, needing to allow something time to germinate? What needs do I have that aren't being met? If none of these questions strike you, ask yourself: What questions do I need to ask to move forward in my life? What questions do I need to ask to release this dysfunction? Give yourself time and stillness to allow the questions to arise. Then see where it goes. Sit or lie down in a comfortable place. If you are able, lightly touch the area that hurts (or have someone else do it if possible). Breathe into the distressed area. Take several breaths in this manner. Bring your consciousness (you might also call it mindfulness or awareness) to this area. Imagine that you are bringing consciousness in from the inside. Invite and allow the area that has been bothering you to shift and change. Allow it come up to present time. Allow other places in your body to shift and change and rebalance if it feels right. Notice how the area you've been working with feels. Notice how the rest of your body feels. Take a few moments and a few slow, deep, comfortable breaths to integrate the change before getting up. If you can, move the area that you've been working with, noticing how it feels. This approach can bring amazing relief for musculoskeletal discomfort, but can help with other types as well. It can also be valuable to have someone help you with this, keeping their hand gently on the area of your body that hurts and talking you through each of the steps. To perform acupressure, press the acupoint(s) firmly with your finger, thumb, or knuckles. If you're working with a delicate area, use lighter pressure. Don't press so hard that it's extremely uncomfortable. Hold the point(s) until you feel relief, until you feel the energy shift, or for about a minute. It's good to do acupressure regularly every day until the problem resolves. Traditional Chinese Medicine can be very complex, but one or a combination of these four points will help in many cases. LI4 is one of the most important analgesic points, especially for the head, face and upper body. Excellent for headaches, shoulder and arm pain, toothaches, arthritis, eliminating toxins. Location: In the web between the thumb and index finger, on the highest point of the bulge formed when they are brought together. Note: Don't use on pregnant women, because it can cause premature labor, or people already experiencing too much "flow," such as diarrhea or heavy menstrual flow. This major energy-moving point relieves pain and congestion; clears the energy system; detoxifies; releases pent-up or stagnant energy; reduces anger, irritability and tension headaches. Best used with LI4 (above). When I use LIV3, people often feel a powerful movement of energy. Location: On the top of the foot, near the top of the "valley" between the bones leading to the big and second toes. Again, don't use on pregnant women, because it can cause premature labor, or people already experiencing too much "flow," such as diarrhea or heavy menstrual flow. This major nourishing point is known primarily for its ability to build vitality, but it's also good for generalized pain relief and any time there's an energy deficiency. GB 20 relaxes, releases endorphins, benefits the brain, releases trauma, and is an analgesic, especially for the head and neck. Excellent for headaches, stiff necks, balancing brain hemispheres, stress. One of my personal favorites for headaches. Location: In the hollows just below the base of the skull, about three finger-widths out from the midline. Sit or recline and exhale slowly and continuously in a thin stream through pursed lips. Imagine that a candle 6 inches away would flicker but not go out. Count slowly (silently) as you exhale as completely as is comfortable. Inhale through your nose (belly breathe!). Work up to repeating the process approximately 30 times twice a day. In the early stages of this practice, you might feel anxious after just a few cycles of breath. (I did.) If so, stop and briefly try again later. The anxiety will go away with practice. If you feel light-headed, just sit quietly till the feeling subsides. It may take several months to establish new, healthier breathing habits, but over time, you should feel better. I hope some of these chronic pain self care ideas provide you some helpful tools for yourself, your loved ones or clients. Often there's no one single antidote, rather we have to combine a number of techniques to feel better. Return from Chronic Pain Self Care to Pain Relief main page.